Some of the provisions in the House bill that benefit the middle-class — like lower tax rates and fewer brackets, an increased standard deduction, and a $300 tax credit for each adult in a household — are designed to expire or become less generous over time. Some of the provisions that benefit the wealthy, such as the reduction and eventual repeal of the estate tax, become more generous over time. The result is that by 2027, the benefits of the House bill become increasingly generous for the richest one percent compared to other income groups. The middle 20 percent of income-earners in America, the group that is quite literally the “middle-class,” would receive 10 percent of the benefits in the U.S. in 2018 and just 8 percent of the benefits in 2027. In other words, in 2027 the middle fifth of Americans would receive only one sixth of the benefits received by the richest one percent of Americans. According to Congress’s official revenue estimators, the House bill would have a net effect of losing a little less than $1.5 trillion over ten years. The bill was drafted with the goal of increasing the deficit by no more than $1.5 trillion over ten years because this is the rule set out in a budget resolution already passed by Congress. In order to meet this goal while still enacting tax cuts that some lawmakers desire, the bill’s drafters included a complex scheme that phases some provisions in over time while causing others to expire and relying on some revenue raised that would not likely be sustained in the future. 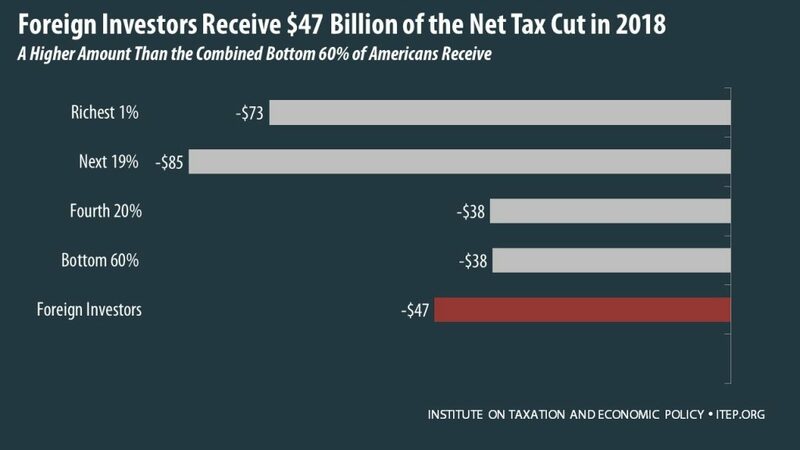 The richest one percent of Americans would enjoy an average tax cut of $48,580 in 2018, and this average tax cut would rise to $64,720 in 2027. The middle fifth of income-earners would receive an average tax cut of $750 in 2018, which would fall to $460 in 2027. Some might be tempted to believe that because income inequality is so great, the tax cuts might be simply proportionate to household income. One might wonder if the $460 average tax cut for the middle fifth of income-earners is fairly significant relative to their income level, and the average tax break of $64,720 for the richest one percent that year is simply proportionate to the income of that group. But that is not what the numbers show. Even when measured as a percentage of income, the richest one percent receive a larger average tax break in 2018 and 2027 than any other income group. 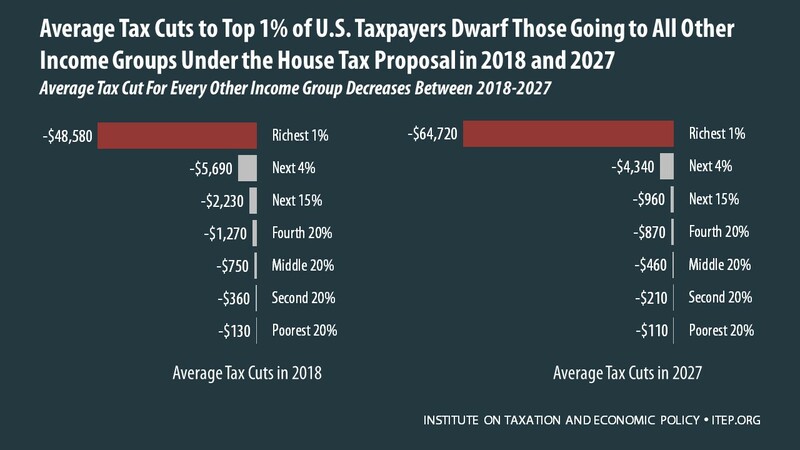 As illustrated in the graph below, the richest one percent receive an average tax cut equal to about two and a half percent of their income in 2018 and 2027. The middle fifth of income-earners receive a break equal to 1.4 percent of their income in 2018, falling to just 0.6 percent of their income in 2027. The House bill includes features that are apparently designed to make the plan appear less generous to the wealthy than previous versions of tax reform that have been discussed. For example, the top personal income tax rate today is 39.6 percent, and in a departure from previous proposals, this bill would retain that top rate for married couples with taxable income exceeding $1 million and singles with taxable income exceeding $500,000. Also, the benefits of the lowest income tax bracket (12 percent under the House bill) would be phased out for the very rich. But these changes prove to be largely cosmetic because much of the benefits for the richest Americans come from other provisions in the bill. For example, the provision reducing the corporate tax rate from 35 percent to 20 percent would mostly benefit the owners of corporate stocks, which mostly include high-income Americans and foreign investors. Another example is the special top tax rate of 25 percent for some “pass-through” business income. Pass-through businesses have profits that are not subject to the corporate income tax but instead are reported on their owners’ tax returns and subject only to the personal income tax. While proponents of this special tax rate for pass-through businesses often call it a break for “small businesses,” most pass-through income goes to the richest one percent of Americans. The White House has recently argued that any plan to cut taxes will inevitably provide the largest benefits to the rich because they have the most income and because they pay the most in taxes. 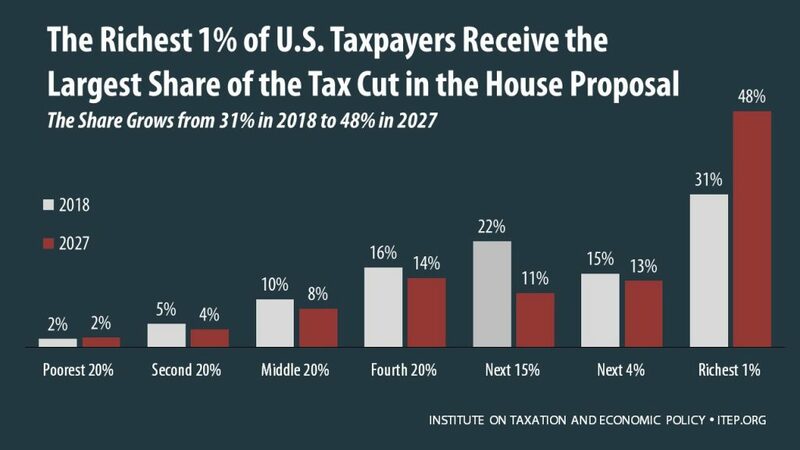 But as the graph below shows, the share of the bill’s tax cuts that the richest one percent would receive in 2018 (31 percent) exceeds their share of income and the share of federal taxes paid by this group. Some households in every income group would face a tax hike under the bill. For example, in 2018, 8 percent of households in the middle fifth of the income distribution would face a tax hike, rising to 21 percent of these households in 2027. This would occur because several provisions in the bill raise revenue by repealing or limiting tax breaks that benefit the middle-class, and for some households the loss of these tax breaks would not be offset by the new tax breaks introduced in the bill. For example, the bill would increase the standard deduction in 2018 from $13,000 for a married couple to $24,400. But the bill also repeals the personal exemption that taxpayers claim for each member of their household. The standard deduction and the personal exemption together define the amount of income that is free of federal income taxes for most middle-class families. For example, in 2018, a married couple with two children will be allowed, under current law, to claim a standard deduction of $13,000 plus four personal exemptions of $4,150 for each member of their family, for a total of $29,600 of income that is shielded from federal income taxes. Under the House bill, this family would be allowed to claim a standard deduction of $24,400 but no personal exemptions, meaning only $24,400 of income would be shielded from federal income taxes. The bill does offer an additional benefit to the middle-class by increasing the child tax credit from $1,000 to $1,600 and introducing a new tax credit of $300 for each member of the family that is not a child. But, as explained later in this report, these changes would not help the poorest families and the $300 credit for other members of the family would expire after 2022. Some households would not be affected at all by the House bill. 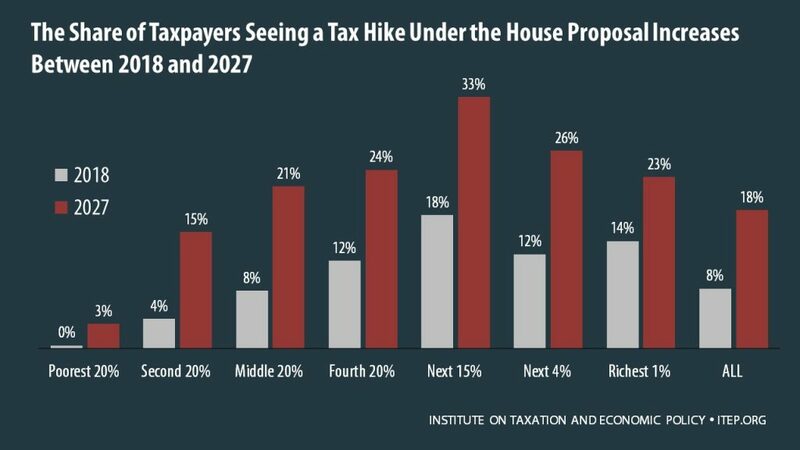 In 2018, nearly half of taxpayers among the poorest fifth of Americans would not see a tax hike or a tax cut. This report has, up to this point, discussed the distribution of benefits of the bill among households in the United States. But the bill would also provide significant benefits to foreign investors. Several provisions of the bill would change the federal corporate income tax and by far the most significant would reduce the statutory corporate income tax rate from 35 percent to 20 percent. As explained in more detail in the methodology section, corporate tax cuts mostly benefit those who own corporate stocks. Recent academic research has concluded that 35 percent of stocks in American corporations are owned by foreign investors, who would therefore receive a significant share of the benefits from a corporate tax cut. In 2018, foreign investors would receive $47 billion in benefits from the House bill in 2018. This is more than the $38 billion in benefits that would go to the bottom three-fifths of Americans that year. The effects of this tax bill on households vary a great deal, even for households in the same income group, depending on the types of income and types of expenses that different families have. This also results in a great deal of variation across states, which is illustrated in detail in the state-by-state figures in the appendix. 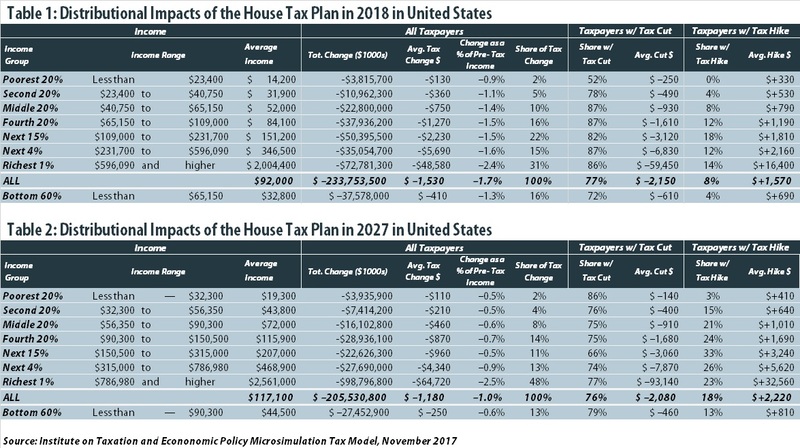 This analysis incorporates all the significant provisions in the House tax bill, including any that cost at least $50 billion or lose at least $50 billion over ten years according to estimates from the Joint Committee on Taxation (JCT), which are the official estimates used by Congress. This analysis also includes provisions that cost or raise less than $50 billion but have a significant impact in one year, such as the provision allowing full expensing for companies for five years. The proposed changes to the international corporate tax rules, including adoption of a “territorial” tax system and other changes, are included in their entirety because of the many ways in which these proposals interact with each other. This analysis does not incorporate the proposals to impose a one-time tax, at reduced rates, on the profits that American corporations are officially holding offshore. This proposal, which is sometimes called a “deemed repatriation,” raises revenue during the official ten-year budget window and is technically a tax increase. But this provision is actually a significant break to many, if not most, American multinational corporations and the revenue raised would be temporary. As another ITEP report explains, this provision would, in the long-run, provide a break of $529 billion to American multinational corporations. In total, this analysis includes the revenue-losing provisions that account for 98 percent of the bill’s gross revenue costs according to JCT. This analysis includes the revenue-raising provisions that account for 89 percent of the gross revenue raised (or 84 percent if the deemed repatriation provision is considered a revenue increase). New rate schedule with phaseout for lowest rate. Increase standard deduction and repeal additional standard deduction for seniors. Expand child tax credit, new credits for other household members. Reduce and eventually repeal estate tax. Special 25% rate for pass-through businesses. Reduce corporate tax rate and repeal corporate AMT. Full expensing of equipment for five years. Limit net interest deductions for businesses. Change net operating loss deductions. Repeal domestic production activities deduction. Repeal of credit for testing certain pharmaceuticals. Territorial system and other international corporate tax changes. Below is a more detailed description of the most significant provisions in the House bill. The House bill is supposed to simplify the tax code by reducing the number of tax brackets from seven to four. However, the number of tax brackets is not related to the level of complexity in the tax code. Calculating taxable income, which is the income subject to the tax rates, can be complex. But once that amount is calculated, it can be looked up on a table provided by the IRS to determine tax liability. Taxpayers are not required to do complicated calculations involving all the tax brackets. The House bill in effect creates a tax system with six brackets, not four. The reason is that the bill goes to great lengths to preserve the existing tax rates on capital gains and dividend income. Under current law, each personal income tax bracket has a rate that applies to most income but also has a lower rate that applies to income taking the form of capital gains and stock dividends. The Congressional Budget Office has found that more than two-thirds of the benefits of these preferential tax rates go to the richest one percent of Americans., making them ripe for reform. But the House bill keeps them in place. The bill specifies that the thresholds between the different rates for capital gains and stock dividends would remain unchanged, even though they do not align with the thresholds for the new tax rates for ordinary income. Effectively that means that there are more than four tax brackets. 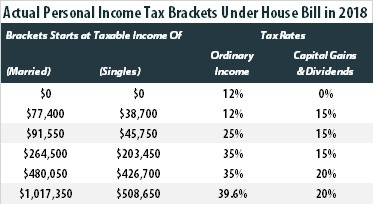 Here is the personal income tax bracket structure described by proponents of the bill. The rates apply to ordinary income and they typically do not mention capital gains or stock dividends at all. 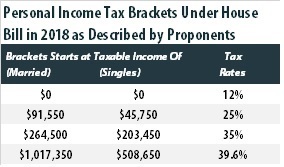 Here is the personal income tax bracket structure that would exist under the bill when one considers the rates that apply to capital gains and stock dividends. It is difficult to see this change as a step towards a simpler tax system. When calculating their taxable income, taxpayers are allowed to deduct amounts that Congress has decided should not be included in determining how much income is available to pay taxes and expenses that Congress has decided to subsidize through the tax code for other policy reasons. Most of these deductions are the “itemized” deductions. However, taxpayers are also allowed to instead claim a standard deduction. Most taxpayers, particularly those who are not wealthy, claim the standard deduction because they are eligible to claim little or nothing in itemized deductions. In other words, the standard deduction reduces the amount of income on which low- and middle-income people must pay taxes. The tax code also allows each taxpayer to claim a personal exemption for herself, her and spouse and any dependents she has, which further reduces the amount of income that is subject to taxes. The House bill increases the standard deduction, which reduces the amount of income subject to taxes for most families, but also repeals personal exemptions, which has the result of increasing the amount of income that is subject to taxes. As already explained, whether the combination results in higher taxes or lower taxes for a particular family depends on their situation. For some families, the higher standard deduction is not as large as the combined standard deduction and personal exemptions they claim today. Under the House bill, the standard deduction after 2018 would be indexed to a measure of inflation that grows more slowly over time. (This inflation adjustment is known to economists as “chained CPI.”) As a result, the standard deduction would become less generous over time for those who claim it. Some families who lose benefits because their newly increased standard deduction fails to compensate for their lost personal exemptions might be nonetheless better off because of the House bill’s proposal to increase the maximum Child Tax Credit from $1,000 to $1,600 and create a new credit of $300 for each adult in the taxpayer’s household. But these benefits would be limited for several reasons. First, the refundable portion of the child credit would remain limited to $1,000. The limit would rise slowly over time (indexed to the slower measure of inflation) but even by 2027 it would be only $1,200. The refundable portion of the credit is the amount that a family can claim even if their income is so low that they do not otherwise owe income taxes. In other words, because the refundable portion of the credit would not (for the most part) increase, the poorest families would see no benefit. Second, the new credit of $300 for adults in the taxpayer’s household would not be refundable, would not be indexed for inflation, and would expire at the end of 2022 under the House bill. Congress has decided over time to subsidize home ownership, charitable giving and several other activities through the tax code by allowing taxpayers to deduct these expenses on their personal income tax return. Most taxpayers do not “itemize” such deductions but instead claim the standard deduction because it is more beneficial given their specific circumstances. But those who currently itemize deductions would see several changes under the House bill. The deduction for state and local taxes would be scaled back dramatically. State and local income taxes would no longer be deductible at all. Local property taxes could be deducted, but the amount deductible would be capped at $10,000. The mortgage interest deduction would be limited. Today, a taxpayer can deduct interest on a mortgage of up to $1 million and can deduct mortgage interest on two homes. Under the House bill, the limit would be lowered from $1 million to $500,000 and the deduction would no longer be allowed for interest on a second home or on a home equity loan. Far fewer taxpayers would claim the mortgage interest deduction, mainly because the combination of itemized deductions they could claim (which would no longer include state and local income taxes) would be less than the increased standard deduction under the House bill. The deduction for charitable giving would be retained. But, like the mortgage interest deduction, it would be claimed by far fewer taxpayers because, for many, the combination of itemized deductions they could claim would be less than the more generous standard deduction. The alternative minimum tax (AMT) is a backstop tax meant to ensure that relatively well-off people pay at least some federal income taxes no matter how many special breaks they claim. In theory, the tax system could be simplified and special breaks and loopholes could be eliminated so that there is no need for the AMT. However, some wealthy taxpayers would pay little or nothing in income taxes if repeal of the AMT is not coupled with elimination of the many special breaks and loopholes that it limits. Donald Trump himself paid substantial AMT in 2005 and, if the AMT did not exist, would have paid an effective income tax rate of less than 4 percent. The federal estate tax is paid only on the largest estates that are passed from one generation to the next. In 2017, a married couple could leave to their heirs an estate worth at least $11 million and no tax would be collected on it. Usually even larger estates avoid the tax because charitable bequests and certain other amounts are not included in the taxable estate. As a result, only about 0.2 percent — that’s two-tenths of one percent — of deaths result in estate tax liability. The House bill would double the amount that is exempt from the estate tax. For a married couple, this means they could pass on at least $22 million (and usually more) without any estate tax liability. Starting in 2023, the estate tax would be entirely repealed under the House bill. Business that do not pay the corporate income tax are often called “pass-through” businesses, the idea being that the income is passed through to the owners and reported on their personal income tax form. Sometimes pass-through companies are mistakenly characterized as small businesses. The truth is that many law firms, hedge funds, and even huge companies like Bechtel are structured as pass-through companies. It’s also the case that the owners of pass-throughs who receive most of their profits are mostly, but not entirely, high-income individuals. The House bill includes a special tax rate of just 25 percent for this income. Many tax experts have commented that highly compensated individuals could respond to the change by routing their income through pass-through entities to take advantage of the lower rate. For example, if John Smith is the CEO of ACME and is paid a salary of $10 million a year, that salary would be subject to the top income tax rate of 35 percent under the framework. Smith could instead form a new pass-through entity called John Smith Services, which contracts with ACME to provide management services. Instead of receiving a salary from ACME, Smith would receive pass-through income that would be taxed at just 25 percent. The House bill attempts to address this problem with a complicated set of rules. “Passive” owners of pass-through business (meaning owners who do not actually work in the business but have invested in it) would be allowed to pay 25 percent on their income from the business. Those who are “active” owners would only be allowed the special tax rate on 30 percent of their income, or they could choose to apply a complicated formula to determine how much of their income can be subject to the lower rate based on the amount of capital they have invested. Strangely, the result seems to be that taxpayers who do not work to earn their income would be treated more generously, and the tax code would be far more complex. The House bill would reduce the statutory corporate tax rate from 35 percent to 20 percent. But the effective tax rate paid by American corporations (the share of profits actually paid in taxes) is far less than 35 percent because of special breaks and loopholes in the tax code. A 2016 study produced by the Government Accountability Office found that the effective tax rate paid by large profitable American corporations from 2008 through 2012 was just 14 percent. 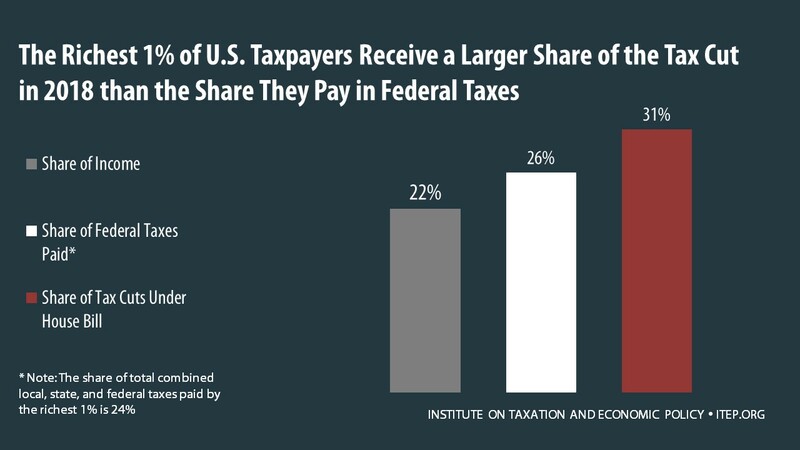 It found that the share of these corporations paying no federal income tax at all was 19.5 percent in 2012 and 24.1 percent in 2011. In other words, there is little justification for reducing the statutory corporate income tax rate as the House bill would. Proposed changes affecting individuals are modeled using ITEP’s microsimulation model, which generates tax estimates for a sample of representative taxpayer records in each state. For proposed changes affecting corporations, we use JCT’s cost estimates for the bill as a guide to the magnitude of each provision’s impact and then use the ITEP microsimulation model to determine how those impacts would be distributed among taxpayers. For changes in corporate taxes, ITEP follows the approach taken by JCT in assuming that in the short-run (which is assumed to be one year), the costs or benefits of these changes fall entirely on the owners of stocks in American corporations, but in the long-run (which is assumed to occur in the tenth year) a quarter of these impacts fall on labor and the rest on the owners of corporate stocks. JCT assumes that a quarter of the benefits of a corporate tax cut flow to labor in the long-run because lower corporate taxes allow for greater investment in the U.S., which facilitates more hiring of American workers. However, it is unclear that lower taxes lead corporations to invest more, enhance productivity and lead to more hiring and increased wages. And even if this occurs it is unclear when the “long-run” scenario will be fully achieved. Given this uncertainty, these estimates should be considered a best-case scenario from the perspective of workers. ITEP differs from JCT in that we have updated our approach to account for new research that finds 35 percent of American corporate stocks are owned by foreign investors, a larger fraction than we previously assumed. This means that 35 percent of any benefits to the owners of corporate stocks go to foreign investors rather than households in the U.S.
 One provision would transition to a new set of rules for international corporations by imposing a one-time tax on the profits they are officially holding offshore, at a rate that is lower than what they are required to pay under current law. This provision, often called a “deemed repatriation,” is estimated to raise $223 billion over ten years. As explained later in this report, this provision is actually a significant tax cut for these corporations in the long-run. The revenue raised would only appear in the first decade after the House bill is enacted.